If you look back on the sixties and, on balance, you think there was more good than harm in it, you're probably a Democrat, and if you think there was more harm than good, you're probably a Republican. Because it works, that's why. Republicans have been campaigning against "the sixties" ever since the 1960s themselves. McCain was following a time-tested strategy, employing a tactic used by every Republican presidential candidate since Ronald Reagan. Reagan invented "the sixties" during the 1960s and was against "the sixties" even before the decade ended. His political career also marked the start of the Right's active construction of a mythical alternative, a past that supposedly existed before "the sixties." This book examines the ways in which four presidents -- that is, political winners -- used their own selective versions of the 1960s for political gain in the years from 1980 to 2004. It focuses on their conscious manipulation of five topics: John F. Kennedy, Lyndon Johnson's Great Society, the Vietnam War, the civil rights movement, and the era of "the sixties" in general. Each president during this twenty-four-year period offered his own conception of the decade and how Americans should remember it. Between 1980 and 2004 liberals and conservatives alike used selective memories of "the sixties," a period I define as stretching from 1960 to 1974, to win votes.5 Liberals evoked the positive associations of the "good sixties" (1960-1963), while conservatives called up the specter of the "bad sixties" (1964-1974). The "good sixties" refers to the era of President Kennedy and conjures a time of strong national defense, a tough stance against communist expansion, peaceful civil rights protests, and the persistence of "traditional" standards of dress, expression, and family life. The "bad sixties," conversely, refers to the presidencies of Lyndon Johnson and Richard Nixon, a time of urban riots, antiwar protests, difficulties in fighting the Vietnam War, increased incivility, crime, drug abuse, and social unrest. The "good sixties" and the "bad sixties" serve as convenient shorthand for the residual emotional attitudes that Republicans and Democrats -- conservatives and liberals -- elicited, played to, and often deliberately inflamed in the process of constructing their respective narratives of the 1960s. Republicans wielded painful memories of the 1960s as a political weapon to attack Johnson's Great Society, the antiwar movement, and the era's loosening of social restraints on family structure and personal responsibility. While inveighing against the expensive mistakes of that time, the Right also sought to limit the political power of competing memories of the 1960s. These included Kennedy nostalgia, a longing for the era's idealism, the moral authority of the civil rights movement, and fear of "another Vietnam" through reckless foreign interventions. To avoid these pitfalls, conservatives quite cannily refurbished these inconvenient and even threatening memories. Liberal Democrats, by contrast, largely failed to defend themselves against the political uses of the 1960s. Republicans won seven of the ten presidential elections from 1968 to 2004. Only once during that time did a Democrat -- Bill Clinton in 1996 -- win a majority of the fifty states. No Democrat in that span of time won a majority of the white vote. Only Jimmy Carter won a majority (50.1 percent) of the popular vote, and he owed his victory primarily to the aberration of Watergate. The Right's backlash against "the sixties" was a huge success. In explaining in this book how the 1960s have been publicly framed, I am describing a discourse that is essential reading for anyone who wants to know what American politicians are really talking about when they talk about "the sixties." In short, my topic is the polemical cartoonization of the era. When discussing the 1960s, most textbooks focus on liberalism, the civil rights movement, the progressive legislation of the period, and the conflict over the Vietnam War. They usually give little attention, however, to the Right during that turbulent decade, especially at the grassroots level. It is nevertheless important to acknowledge how crucial the 1960s were to the rise of the Right. Since then the Right has relied extensively on social issues, especially by formulating and exploiting hostility to the perceived excesses of "the sixties." The key to the Right's aggressive counterrevolution was its deliberate manipulation of language in the political arena. In turn, the key to understanding the rise of the Right since 1980 is to trace its success in framing the debate over the meaning of the decade in the minds of voters; hence the title of this book. My research for this study therefore took as its starting point more than twenty years' worth of presidential communications: official speeches, radio and television addresses, announcements, proclamations, statements, interviews, exchanges with reporters, comments, remarks, and memoirs. To put these into context, I also consulted numerous works of other historians, along with presidential and political memoirs dating from the early 1960s to 2004. In addition, I analyzed the speechwriting archives of the Ronald Reagan and George H. W. Bush presidential libraries, which hold speech drafts, speechwriters' comments, and White House memoranda, as well as personal correspondence (much of it handwritten) among speechwriters, presidential aides, cabinet members, colleagues, friends, and the presidents themselves. Finally, and most significantly, in 2004 and early 2005 I interviewed more than 120 political figures, politicians, cabinet members, speechwriters, advisers, strategists, historians, journalists, and activists from across the political spectrum. They spoke candidly, in detail, completely on the record, and often at length on the political and social legacies of the 1960s and how the presidents since 1980 had perceived recent history and modified it for public consumption to suit their partisan purposes. Some of what I heard surprised me. First, while out-of-power liberals quite predictably recalled the 1960s with nostalgia and passion, conservatives expressed a similar passion for discussing the 1960s. Those on the Right showed even more enthusiasm for this work than did liberals, although conservatives retain great bitterness and anger about that period. Things that happened in the 1960s, as well as things that did not happen, still give people an excuse to fight. Those who experienced the era firsthand are still concerned that the public will remember it the wrong way. Unlike the battles over previous contentious decades -- the 1860s, the 1890s, and the 1930s -- the tensions of the 1960s have not cooled. Each side still wants to get its story out. Liberals believe that they did the right thing in the 1960s and paid the price, whereas conservatives believe that the Left sinned and was rightfully punished. If you are a liberal, your problem with the 1960s is that things did not change enough. If you are a conservative, your problem is that things changed too much. People recall the 1960s with surprising passion because the fight over "the sixties" has not stopped. The decade is still contested terrain, as the nation has not yet fully come to terms with its impact. The memory of the Vietnam War, the Kennedy presidency, the Great Society, and the changing social norms of the 1960s will not remain hot-button topics forever (who still argues about Calvin Coolidge? ), but they still are today. Each of these subjects lends itself to historical interpretation and reinterpretation, and each president since 1980 has attempted to fashion a useful historical memory of these issues in voters' minds. Reading Framing the Sixties will be uncomfortable for those expecting a different type of book, for a number of reasons. First, this is not a history of the events of the 1960s. I presume the reader's familiarity with the decade. I of course refer to those events, but I do not attempt to narrate them as a whole, much less account for them in an explanatory way. Instead this book is about what use the Right has made of the 1960s. I explain how the most toxic elements of that time have entered the political bloodstream and continue to circulate there. Second, I was able to interview only ten women and two African Americans. I certainly wish that others I approached had not declined my request for interviews or failed to respond at all. But also, if more women and people of color had been presidential advisers and speechwriters and thus in a position to shape public discourse, this might have been a very different book. Third, this is an interpretation from a particular viewpoint, primarily a study of political insiders and elites: the view from above. I selected those I interviewed because I am interested in the political and ideological forces that have made only certain things about the 1960s speakable for politicians trying to get elected. I am interested in the discourse that enables and enhances political power. This book is not about evaluating ideas on their merits, least of all their ideological merits. It is about evaluating their political efficacy. It is about ideas that work. Fourth, in these interviews I felt like a fly on the wall at a reunion of the key players of the 1960s. The blessing and the curse of this method is that I was able to talk to each person no more than once. I was not in a position to demand follow-up interviews; I had only one shot. Nor was I in a position to conduct a hostile or adversarial interview with anyone I disagreed with politically. I could not cross-examine. My intent was merely to record each person's side of the story and then to analyze my data. In a perfect world I would have used a different approach; but readers will still benefit from access to this virtual cocktail party of political insiders talking about Reagan, the two Bushes, Clinton, and the political uses of the 1960s. Finally, readers will notice the absence of much discussion of the women's movement. That is because it is a moot point for the Right. Neither the women's movement nor, for that matter, the civil rights movement is part of "the sixties" as that has been understood by the public. "The sixties" has come to mean the era's excesses: the antiwar movement, the counterculture, Black Power. Nor has it come to be understood as encompassing gay liberation, disability rights, environmentalism, increased rights for the young and the elderly, birth control, the rise of conservative media, the space program, the American Indian movement, the United Farm Workers, the Equal Rights Amendment, or consumer safety issues -- though all these issues fall within the time period discussed. These are not what "the sixties" are about. Simply put, it did not serve the Right's interests to demean the women's movement overtly. The four presidents examined here did not address feminism nearly as frequently as they addressed the central issues of this book: JFK, LBJ, the civil rights movement, Vietnam, and "the sixties" as a cultural phenomenon. True, in her speech at the 1992 Republican National Convention, Marilyn Quayle said: "I sometimes think that the liberals are always so angry because they believed the grandiose promises of the liberation movements. They're disappointed because most women do not wish to be liberated from their essential natures as women. "12 But this foray of hers was the exception, not the rule. Others might think these things, but they have not tended to say them in public. The Republican presidents I examined did not by and large resort to such inflammatory antifeminist rhetoric. In my interviews only the Left consistently brought up the women's movement -- and almost always to defend the 1960s, often linking gay rights, the environmental movement, and the women's movement together in the same litany. While several prominent liberals mentioned the backlash against feminism, far more prevalent in our discussions was the belief that women's rights have continued to expand since the 1960s. The focus of this book is on a quarter century of presidential speeches and the nearly 700,000 words of interviews I conducted. Writing books is partly about making choices, and in the end I decided not to write about the political manipulation of gender sentiments since 1980. It would make a fascinating study, but it is simply not what this one is about. This book explores first the two notions of the "good" and the "bad" sixties. I look at the ways in which John F. Kennedy is not part of "the sixties" but Richard Nixon is, and also at how part and parcel of the animosity toward the 1960s reflects a nostalgia for the 1950s. I also discuss how "the sixties" -- especially Vietnam and Watergate -- helped pave the way for the triumph of the conservative movement. Watergate hurt the Republicans in the short term. But in the long run it helped them by discrediting the prestige of government in general. The combination of Watergate and Vietnam moved America away from liberalism and toward conservatism by fueling mistrust in government at both ends of the political spectrum. For the Left, Vietnam revealed the government pursuing an immoral war. For the Right, it demonstrated a government too incompetent to fight a war and win it. By seeming to prove that the United States itself was in decline, Vietnam and Watergate led to a decline in public support for a strong, activist government. Nowhere is this use of "the sixties" more evident than in the story of Ronald Reagan's political career. So our story begins with the rise of Reagan during the 1960s, when he was elected governor of California, and continues through his two campaigns for the presidency in 1976 and 1980. Once he became president, Reagan vowed to "renew America" after the trauma of the 1960s. Expressing nostalgia for JFK and the "good sixties," Reagan spoke of Kennedy more than he mentioned any other president but harshly attacked Lyndon Johnson's "bad sixties." I discuss the role that race played in Reagan's tactics, his reinterpretation of the Vietnam War, and his desire to overcome the "Vietnam syndrome," broadly defined as reluctance by the United States to intervene militarily overseas after the debacle in Southeast Asia. Like Reagan, Bush staked his political success on demonizing the 1960s. Also like Reagan, he claimed to have "kicked the Vietnam syndrome," in his case by waging the 1991 Persian Gulf War. Bush continued and even accelerated the critique of the 1960s that Reagan had begun through his response to the 1992 riots in Los Angeles occasioned by the police beating of Rodney King, through his vice president Dan Quayle's attacks on the television character Murphy Brown, and through his utter distaste for the candidacy of Bill Clinton. As the first baby boomer to run for president, Clinton renewed and reintensified the national debate over the meaning of the 1960s. I examine how Clinton constructed the 1960s, and specifically how he recast them to suit the 1990s, a conservative era at odds with everything 1960s liberalism stood for. Clinton used the liberal 1960s icons he so dearly loved -- John and Robert Kennedy and Martin Luther King -- to promote his own centrist political agenda, his "Third Way." Clinton's pronouncements, especially regarding the Vietnam War and what he considered the true meaning of the 1960s, demonstrate how the constant attacks on "the sixties" during the twelve-year period of the Reagan and Bush presidencies had put the Democrats on the defensive on all matters regarding the era. Bush's hostility to the 1960s led him all the way to the White House in 2000 and to reelection in 2004. Aping Reagan, he explicitly campaigned on a platform of restoring what the country had supposedly lost under the regrettable influence of liberals. John Kerry was the perfect opponent against whom to test the appeal of an anti-1960s message; the memory of "the sixties," especially of the Vietnam War and the antiwar movement, heavily influenced the 2004 presidential campaign. In four campaigns between 1994 and 2004, two for the governorship of Texas and two for the presidency, Bush thought it expedient to invoke a restoration of the pre-1960s America he had experienced during his childhood in Texas in the 1950s. And he was proved right. Nostalgia, therefore, plays an integral part in contemporary American political culture. For the Right, the 1960s replaced an earlier version of America in which the country was moral and just. The 1960s elicited anger on the Right by questioning this cherished notion -- the mythical view of Americans as noble, fair, honest, and righteous -- and arguing that the nation needed to change. The 1960s rejection of traditional values challenged the established view of American exceptionalism, and in doing so eventually destroyed liberalism and propelled the modern Right to power. The Republican presidents from 1980 on -- Reagan and the two Bushes -- all vigorously tapped into a national longing for pre-1960s America. Each expressed a desire to return the nation to a past recalled as calmer, rosier, and more certain, an America imagined as free of racial, generational, and ideological conflict. While Reagan and George H. W. Bush came of age well before the 1960s, the younger Bush shared this nostalgia as a kind of cultural legacy. All three promised to restore to public life the virtues supposedly lost through the misguided policies of the "bad sixties." While a young George W. Bush bridled at the changes taking place in the late 1960s, Bill Clinton was a rising star just beginning to shine. Those changes opened up opportunities to the young man from Arkansas that would not have been available ten years earlier. The country was breaking Clinton's way in 1968, not Bush's way. These perceptions would linger in each man's mind and help define today's political climate. What drives the differences between liberals and conservatives? This book offers the memory of the 1960s as the answer. When future historians seek to explain the dynamics of U.S. politics in the last quarter of the twentieth century and the first decade of the twenty-first, they will find a helpful tool in the use, and misuse, of the memory of that era. Over three decades later, the 1960s still cast a long shadow over American politics. "The 1960s serve as a hinge of history," said political author Bob Woodward. one's view of the era answers the question, "Which side were you on? "22 Former left-wing radical Tom Hayden remarked in 2004 that we were still fighting over the 1960s "because people shaped by the sixties will dominate our institutions for another decade, and also because the issues raised by the sixties have continued. "23 Like the Civil War, "the sixties" divided America, and for a generation or more after the struggles and conflicts of the 1960s ended, the nation has continued to argue over the decade's impact. Eventually we will get over the 1960s, just as we got over the 1860s, the 1890s, and the 1930s. When every voice heard here has fallen silent, we will be done talking about the 1960s -- but only then. Epigraph: Bill Clinton, Bookexpo America, Chicago, June 3, 2004. 1. Philip Elliott, "McCain Mocks Clinton Woodstock Project," USA Today, October 24, 2007. 2. Jim Rutenberg, "The Ad Campaign: A Focus on the '60s, When McCain Was a P.O.W.," New York Times, July 9, 2008. 3. Jim Rutenberg, "Group Plans Ad Criticizing Obama's Ties to Ex-Radical," New York Times, August 22, 2008. 4. Jim Rutenberg, "Obama Campaign Wages Fight against Conservative Group's Ads," www.nytimes.com, August 27, 2008. 5. For this book, a liberal is defined as "one who believes in more government action to meet individual needs." This use of the term can be traced back to 1932, when Franklin Roosevelt defined it while campaigning for president: "Say that civilization is a tree which, as it grows, continually produces rot and dead wood. The radical says: 'Cut it down.' The conservative says: 'Don't touch it.' The liberal compromises: 'Let's prune, so that we lose neither the old trunk nor the new branches.'" William Safire, Safire's New Political Dictionary: The Definitive Guide to the New Language of Politics (New York: Random house, 1993), 407. Although conservatives since 1980 have used "liberal" and "the Left" interchangeably, in the 1960s the new Left, as it was called then, grew out of a hatred for liberals, who the new Left believed were too willing to engage in Vietnam and too cautious about making needed reforms at home. At the same time, liberals in the 1960s had nothing but contempt for the new Left. nevertheless, here "liberal" and "the Left" mean the same thing, as that is how the terms have been used with growing frequency since 1970. Likewise for our purposes a conservative is "a defender of the status quo who, when change becomes necessary in tested institutions or practices, prefers that it come slowly, and in moderation." Modern conservatism is against "government regulation of the economy" and intrusive federal power. As with "liberal" and "Left," I use "conservative" and "the Right" interchangeably to signify a hostility to programs such as affirmative action, school busing for racial balance, increased spending for health and education, the expansion of the welfare state, and the principle of greater tolerance for racial and sexual differences. In the period under study the Right also argued for a more aggressive stance toward communism, for so-called traditional family values, and for supply-side economics and a preference for the free market over active government. Ibid., 144. 6. Curt Smith, interview with the author, May 7, 2004. Smith worked for President Bush from 1989 to 1993, drafting more speeches for him than any other writer. Unless otherwise noted, all interviews quoted in this book were conducted by telephone; the first time each interviewee is mentioned, a brief biographical description will appear in the note. 7. Craig Shirley, interview with the author, July 1, 2004. Shirley was a paid consultant for the Reagan White House from 1985 to 1988, as well as a consultant to Vice President Bush and an informal consultant once he became president. 8. Ken Askew, senior speechwriter for President George H. W. Bush, interview with the author, May 5, 2004. 9. Bill Bradley, interview with the author, December 14, 2004. A former three-term New Jersey Democratic senator, Bradley ran for president in 2000. 10. Caspar Weinberger, interview with the author, June 23, 2004. Weinberger was secretary of defense from 1981 to 1987. he died on March 28, 2006. 11. Robert H. Bork, interview with the author, February 8, 2005. A former judge, Bork was unsuccessfully nominated for the U.S. Supreme Court by Ronald Reagan in 1987. 12. Alessandra Stanley, "Marilyn Quayle Says the 1960's had a Flip Side," New York Times, August 20, 1992. 13. Phyllis Schlafly, interview with the author, April 7, 2004. The conservative antifeminist founder of the Eagle Forum, Schlafly has attended every Republican convention since 1952 and is best known for her successful campaign against the Equal Rights Amendment. 14. Lisa Schiffren, Vice President Quayle's speechwriter in 1991 and 1992, interview with the author, February 4, 2005. 15. Gary Bauer, e-mail interview with the author, June 16, 2004. President Reagan's undersecretary of education and domestic policy adviser from 1985 to 1989, Bauer ran for the 2000 Republican nomination for president. 16. Hanna Rosin, "The Seeds of a Philosophy: Horowitz Cited as Key Influence on Bush," Washington Post, July 23, 2000. 17. George W. Bush, Acceptance Speech at the Republican National Convention, Philadelphia, August 3, 2000, www.pbs.org/newshour/election2000/gopconvention/george_w_bush.html. 18. Frank Rich, op-ed columnist for the New York Times, interview with the author, January 12, 2005. 19. Jeff Shesol, interview with the author, June 29, 2004. A member of President Clinton's senior staff between 1998 and 2001, Shesol served as deputy assistant to the president and as a deputy director of presidential speechwriting. 20. For a study of how history is shaped by competing generations, see William Strauss and Neil Howe, Generations: The History of America's Future, 1584 to 2069 (New York: William Morrow, 1991). 21. See Nicholas Kristof, "George W. Bush's Journey: Confronting the Counterculture," New York Times, June 19, 2000. 22. Bob Woodward, investigative reporter, author, and assistant managing editor of the Washington Post, interview with the author, Washington, D.C., December 15, 2004. 23. Tom Hayden, e-mail correspondence with the author, May 17, 2004. Hayden was a key participant in the antiwar and civil rights movements of the 1960s and co-founder of the activist group Students for a Democratic Society (SDS) in 1962. 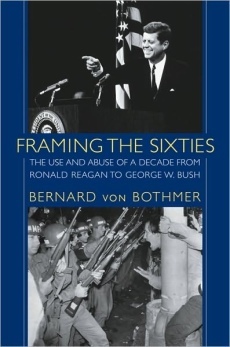 The above is an excerpt from the book Framing the Sixties: The Use and Abuse of a Decade from Ronald Reagan to George W. Bush by Bernard von Bothmer. The above excerpt is a digitally scanned reproduction of text from print. Although this excerpt has been proofread, occasional errors may appear due to the scanning process. Please refer to the finished book for accuracy.